Finding it hard to be comfortable in your own skin? Researchers at the University of Glasgow have invented a kinds of synthetic skin powered entirely by energy from the sun. When Becquerel discovered the photovoltaic effect at 19 years of age, he probably didn’t comprehend its far-reaching applications. He was no Nostradamus, so the solar-powered airplanes, and cars, and homes the discovery facilitated were likely beyond his ken. You can’t blame the guy–solar power has grown prodigiously since its humble beginnings. Now, the technology is entering territory by which even contemporary humans may be surprised. Researchers at the University of Glasgow have invented a kind of synthetic skin powered entirely by energy from the sun. Why does skin need to be powered at all, you ask? That’s where things get interesting. If you think about it, from a functional perspective, the skin is an outer layer of the body capable of sensing touch, temperature, pressure, and so on. In that sense, it is not very different from a sensor, an electronic component used to detect a specific change in the environment. Think about skin the same you would a sensor, and it becomes clear that it could be possible to reverse engineer an electronically-powered artificial equivalent of it. That was the goal with which Dr. Ravinder Dahiya and his team of scientists set about on their research. 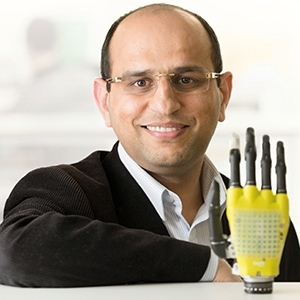 He reports the results in a paper titled “Energy-Autonomous, Flexible, and Transparent Tactile Skin.” What the researchers have been able to do is use graphene–yes, the graphene that everyone calls a wonder material–to reproduce something that works a lot like our actual skin. The artificial alternative has been shown to make highly accurate pressure measurements, which is something other prosthetics have not been able to do so far. 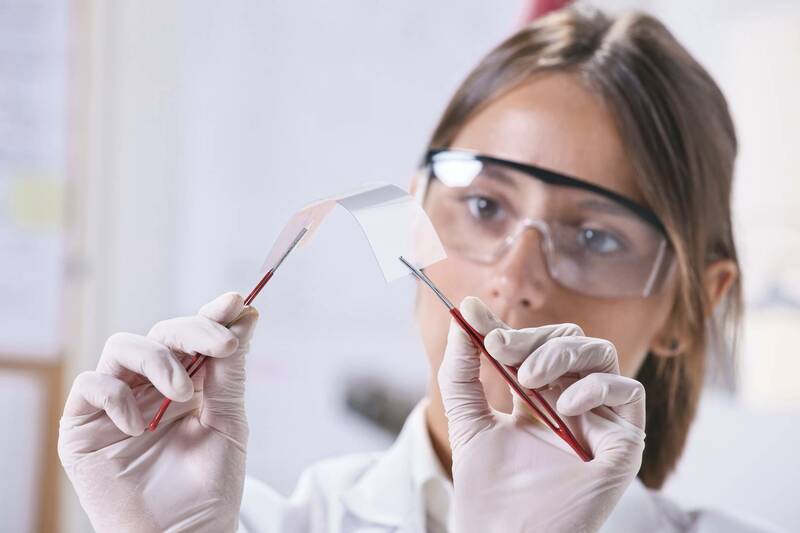 Graphene’s unusual natural properties, such as its material strength (it’s stronger than steel) and high electrical conductivity made it the perfect candidate for the job. Apart from those qualities, graphene is also optically transparent. Transparency was an important consideration because like the paper’s title reveals, the resulting material would have to be “energy-autonomous.” To make that possible, it is fabricated using a single layer of graphene, below which sits an array of solar panels. The graphene permits as much as 98 percent of incident light across to the solar panel, making it simple to produce the 20 nanowatts per square centimeter required to power it. The applications of the invention are many. For humans, it could lead to the creation of prosthetic limbs that are a lot more sensitive to touch and pressure than current solutions. Robots also stand to benefit from the advancement. Dr. Ravinder Dahiya gives the example of a construction line robot, which would be a lot less likely to cause injuries if it was capable of detecting when a human is within its area of operation. Until they become smart enough to intentionally cause us harm, the faux skin could make robots more sensitive, and as a result, working with them a lot safer. And it produces its own power. That is just amazing! I read a little about this a few years ago. Sound very interesting and barring the costs to make something out of this type of material, I can see great things coming out of it! Indestructible material could have a lot of uses and if they are already thinking about using it as a skin, why not use it to make bulletproof jackets and things like that? You have talked about all of the very good things that this new skin would be good for. I like the idea for those that lost a limb, or even the fact that the graphene is basically an indestructible material, isn’t it?